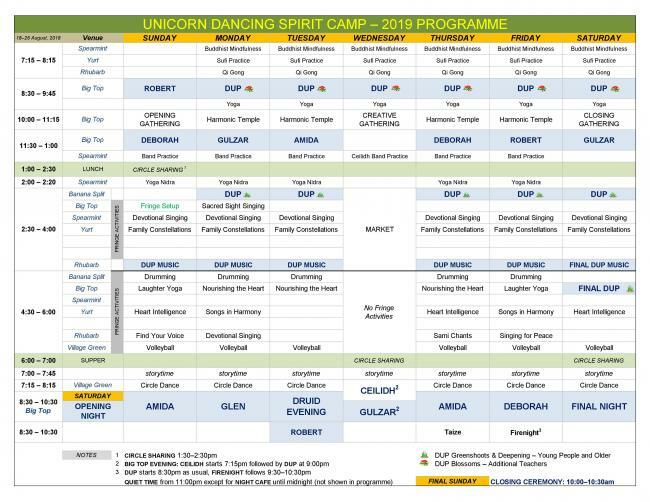 Here are some thoughts about Dancing Spirit Camp to give you a flavour of what we get up to! Spirituality is a many-splendoured love that we honour in all its forms. Hinduism through bhajan and yoga, Buddhism’s mindfulness meditations, Sufism’s healing practices and the danced prayer of zikr. We have Aramaic and more western Christian prayer, Native American Dance of Life, and Earth Magic too. Above all we have the Dances of Universal Peace, whose central purpose is to soften distinctions and differences that arise between people as a result of their convictions... and the universally popular Circle Dances from many European folk traditions. Emotional release can be a healing event when it’s done with awareness in the atmosphere of compassion. Self-awareness is an aspect of that process and include here: Family Constellations, Sufi meditation and Heart Intelligence. 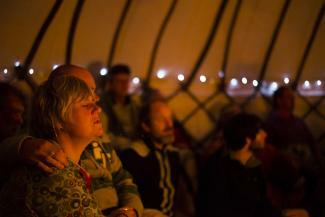 Additionally, the whole business of community camping in circles and learning how to live on the land together in harmony is also profoundly therapeutic. 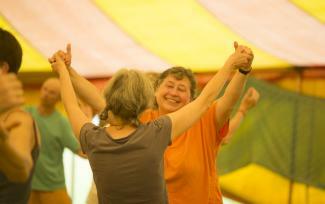 We dance a lot, we sing a lot and we play a lot – as shown by the excellent programme for everyone. There is Harmonic Temple, Ceilidh, Circle Dance, Devotional Singing, volleyball and teen sports, a Creativity Area for kids and parents, and a hundred colourful moments in every hour in every circle; we are also rather proud of our café with its special relaxed caring atmosphere. Please see pdf download link at bottom of page. Dances of Universal Peace began 50 years ago in California as a modern Sufi teaching birthed by Samuel Lewis, a teacher within the Chishti order. They work deeply on the various bodies - physical, emotional, mental and spiritual - to heal and clear. 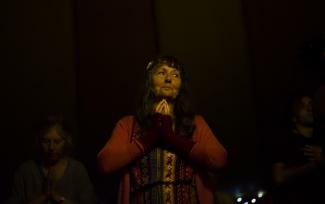 We sing mantra and other sacred phrases as we follow simple movements in a circle in celebration and meditation so that higher states of awareness arise within. Zikr is an Arabic word that means remembrance - is a profound spiritual practice that takes Dances of Universal Peace form to its exaltation. It works to remove layers of mistrust and defense from the heart centre, so that joy can emerge and consciousness unfold. On Thursdays around the world, a million Sufis come together and remember their sacred essence by repeating the name of God with concentrated devotion. As the sun sets on the camp, the circle dance band gathers in the middle of the camp, strikes a chord, and like a musical magnet draws everyone who loves to dance to the sounds of Macedon, Israel, Armenia, Greece and Brittany, and to keep alive the community traditions of village life in the spirit of sharing life's beauty and grace. You can join the band to play or sing and you can learn the steps with experienced leaders. Sometimes vigorous, sometimes meditative, it's always joyful! 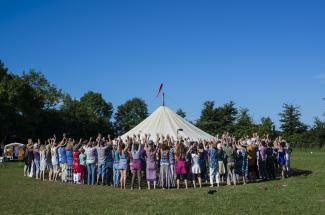 A video of Circle Dance at Unicorn Camp. 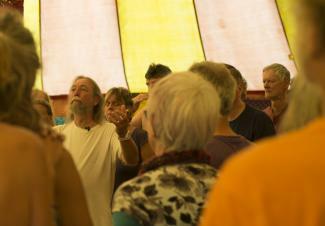 Harmony Singing is an important feature of this camp with a lot to offer dedicated singers, most particularly with the morning sessions of Harmonic Temple. This well-beloved form takes us into the states where angels dwell. Nickomo and Rasullah guide us gently and clearly to learn and enjoy these wonderful sacred chants from all the various spiritual traditions. On Market Day, songbooks are made available for those interested to take them away and teach them later. Using classical sacred music, both modern and ancient we will use written music to sing in 4-part harmonies with support from an experienced teacher in each part. You will need some knowledge of music notation, but we will also encourage people to learn by ear with the help of the teachers. Music will be provided. Teachers: Dee Jarlett, Sarah Pennington and Roz Walker. Development Groups, introduced in 2009, are intended to offer a wide range of methods that can be used for spiritual and personal development. We want to include anything and everything that can help us to find our path to healing and knowledge, so diverse traditions will be represented: astrology, sufi healing, druidry, christianity, buddhism, 7 words, family constellations and so on. We see this as complimentary to the main theme of the camp, and entirely consistent with the teachings and experience of Samuel Lewis. Samuel Lewis (October 18, 1896–January 15, 1971) was an American mystic and dance teacher who founded the Dances of Universal Peace movement. He was also known under his Sufi name Sufi Ahmed Murad Chishti and was addressed by his mureeds and others as Murshid. This is an arabic word that means, 'Exalted Teacher'. In the popular press he was sometimes known as Sufi Sam. In 1919 Lewis entered a Sufi community in Fairfax, California where he met and was influenced by the teachings of Hazrat Inayat Khan an Indian Sufi teacher and musician . A year later he began Zen study with Sogaku Shaku, a disciple of the Rinzai Zen Buddhist Abbot Shaku Soyen. The twin spiritual influences of Sufism and Zen were to remain central throughout his life. He developed an interest in horticulture and promoted seed exchanges across the world. In 1956 he began travelling the world visiting Japan, India, Pakistan and Egypt, seeking the company of other mystics and teachers. In 1967 whilst recovering from a heart attack in a hospital Lewis claimed that he heard the Voice of God speak to him and say, "I make you spiritual leader of the hippies." For the remainder of his life Lewis travelled around California developing and teaching the Dances of Universal Peace which draw on all the spiritual traditions he had encountered. The movement he created continues today in a formal way as Sufi Ruhaniat International, as well as informally through the wide adoption of the Dances of Universal Peace by many other Sufi and non-Sufi groups. 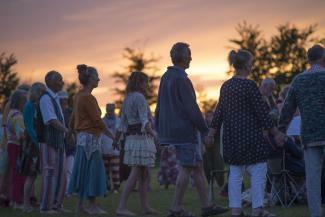 From the beginning of time, sacred movement, song and story have brought people together - at times of seasonal ceremony and celebration, as part of everyday life and life passages, in daily renewal and meditation. The Dances of Universal Peace are part of this timeless tradition.